Marda Unanimous 579 was a Reserve Division Champion at the highly competitive 2016 National Western Stock Show. He is a tremendous individual who posted a 119 weaning ratio, yet offers tremendous calving ease potential. Typical of Unanimous sons, 579 is heavily muscled, good footed, and ultra deep bodied. 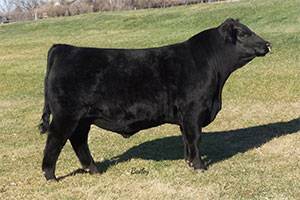 His dam is a donor at Marda Farms, WI, and they'll be infusing 579's genetics into their own herd as well. Marda Farms are gaining national recognition, by having a great bull sale in Nebraska, consigning high performers and sellers at Midland Bull Test, and at the 2016 NWSS, they successfully exhibited 3 reserve champions in the Angus Bull Sale. 579 has a lot of fans, so join the excitement and try him!